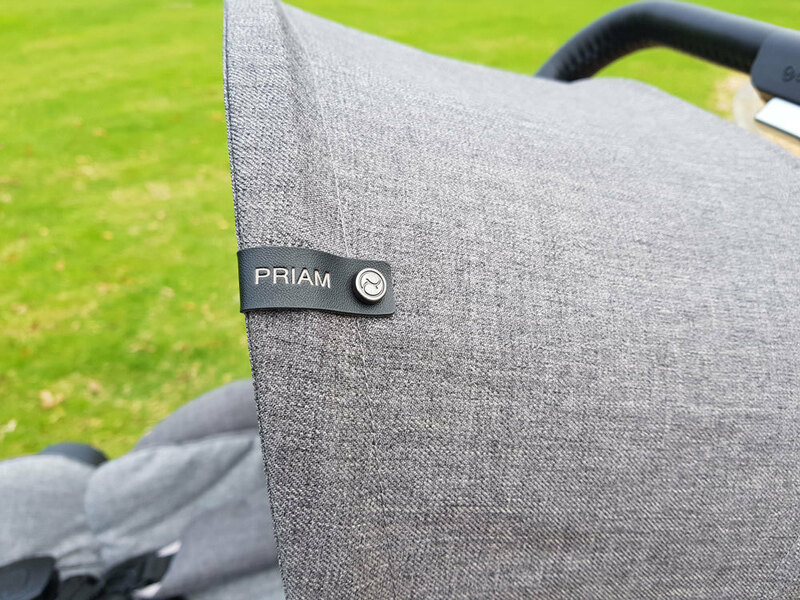 The Cybex Priam is a high end luxury pram. It’s one that features on instagram with celebrities pushing them. It’s a very cool looking pram. And one that earns a little bit of celebrity status of it’s own. The weight capacity is an impressive 22kgs. It has a reversible seat, so it can be parent or forward facing. It can fold with the seat attached – though it’s only practical in the forward facing position. The Cybex Priam allows you to build and customise your pram to suit your needs. Starting from the ground up you choose from “light wheels”, “trekking wheels” and “all terrain wheels”. Then you choose between the original frame and the “all terrain” frame which comes in chrome or matt black. All terrain offers better suspension for a smoother ride. Finally you choose your seat. Either the “2 in 1 Seat”, or the “Lux Seat”. The 2 in 1 Seat comes with bassinet fabric included that goes onto the same circular frame as the upright toddler seat. The Lux Seat simply reclines back to be fully flat for a newborn. For this review I have the Cybex Priam with the light wheels, original frame in chrome and a Lux seat. This setup weighs 12.5kg in total. I’ve been aware of the Cybex Priam for a while now, it’s been around for a couple of years, but it never really appealed to me until I saw it with the Lux seat. For me the the Lux seat on the Cybex Priam sells it. I like that you don’t have to make a decision about when exactly is the right time to move baby from the bassinet to the upright seat. I also like for older baby or toddler than they can lay fully flat for a nap. Rather than having to have their knees bent in a bucket seat. But that’s a matter of preference. I know some people do prefer having a bassinet for their newborns. Also it’s a good sized seat! It should fit to around 4-5 years old in height, though the seat is a little bit on the narrower side so it may be a bit of a squeeze for a solid older child. I’ll add as well that the fold with the Cybex Priam Lux Seat is much more compact. 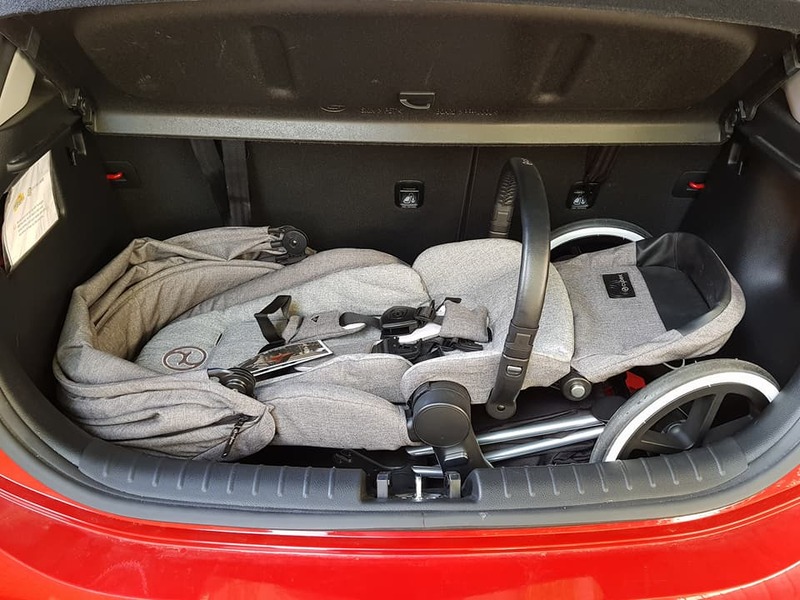 Though I found to fit the Cybex Priam into the small boot of my Kia Rio it worked better to separate the seat from the frame and then lay the seat flat. Also I had to remove one rear wheel to fit it into the boot. So be aware it is a bulky pram and is best suited to a large car. I’d say this model though is a perfect suburban pram. It’s 58cm wide so you won’t feel like you’re taking up the whole footpath, or too much space when you’re cruising around the shopping centre. The seat is also ideal table height, so it’ll be perfect to popping into cafes with baby for a cuppa and a chat. One concern I have is the handlebar is quite bouncey, which means I found the “curb pop” a little bit tricky. 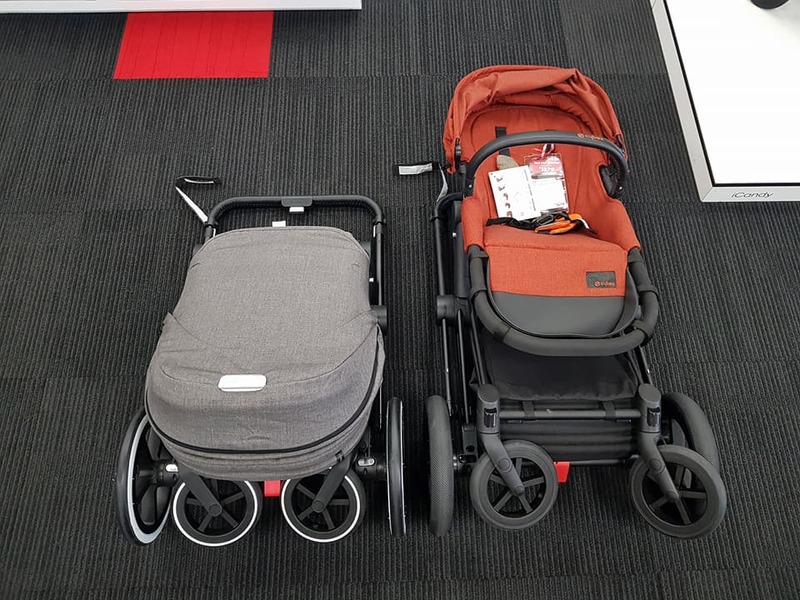 So it’s probably not a great city pram, because not only is that problematic for crossing the road, it would also be difficult to boost up or across to public transport. The other is I found the buckle really difficult to line up and buckle in. It was challenging even with strapping in a friend’s newborn, so I can’t even imagine trying to secure a squirming toddler. So that is something to also be aware of. 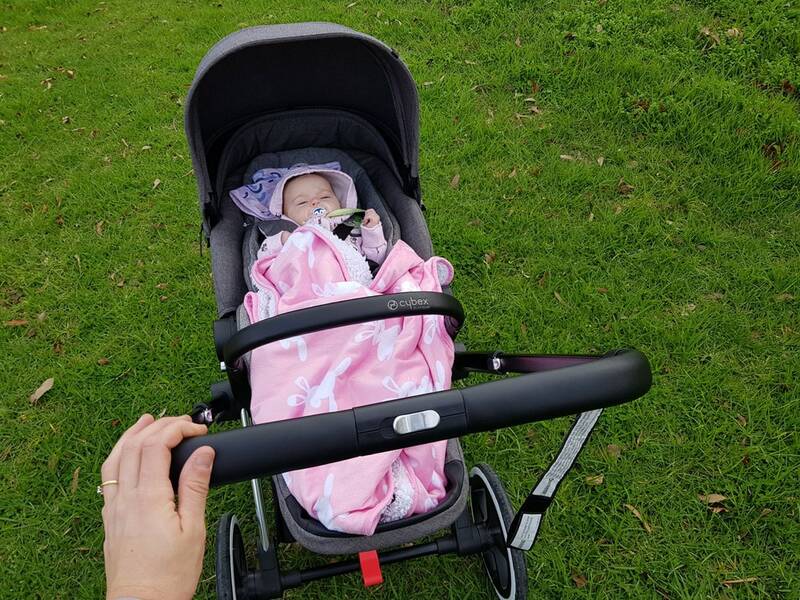 Overall though the Cybex Priam with the lux seat is a very cool pram and one I was very excited about playing with and taking for a stroll. For more pram reviews head to our pram review section! Still can’t find what you’re looking for? Feel free to comment below or contact us and I’ll do my best to match you with your perfect pram! 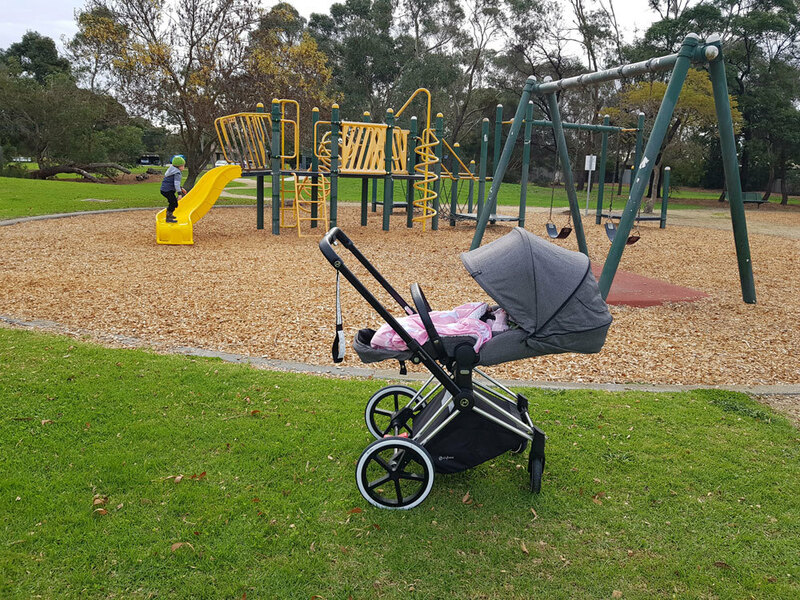 I borrowed the Cybex Priam to review from the lovely team at Baby Train.